"Over the last years, we hear more and more growers complaining about the low prices they receive for their poinsettias. So, what about a white lily instead? 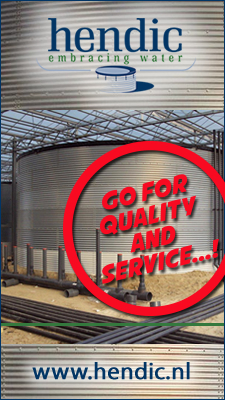 ", says Pieter van der Lans, co-owner of 2Plant International. As many growers do not dare to change the crop for Christmas, van der Lans conducted a survey among US consumers in order to convince the grower of the potential of this product. "The results were surprising." Owners Frank Riteco and Pieter van der Lans of 2Plant International presenting the L.A. Hybrids at the California Spring Trials held last month. For Christmas, the poinsettia is one of the most popular crops to grow and the production of this crop has increased over the last years. In turn, more products are on the market which results in a decrease in price. "More and more, we hear growers complaining about the prices for their poinsettias" van der Lans says. When growing a poinsettia isn't that profitable, why aren't the growers shifting to another crop then? "Poinsettia is known to be the Christmas plant, so many growers do not dare to make the decision to change to another crop." So, in order to convince the grower that there are more crops that have good potential during the Christmas season, van der Lans decided to conduct a survey among US consumers. "Together with Home Garden Panel (a Metrolina greenhouse company), we surveyed over 500 US consumers and showed them 2 L.A. Hybrids - one Oriental Lily for 9.99 USD and one Asiatic Lily for 8.99 USD - and asked them one question and gave them 6 answers to choose from." The questions and answers (in percentages). Interestingly, only 28 percent of the respondents will not buy lilies for Christmas. 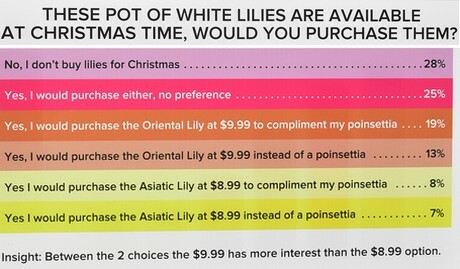 This means, that 72% of the respondents are interested in buying lilies for Christmas and between the 2 choices, the majority was interested in the most expensive one." The results of the survey open up new opportunities for the growers. 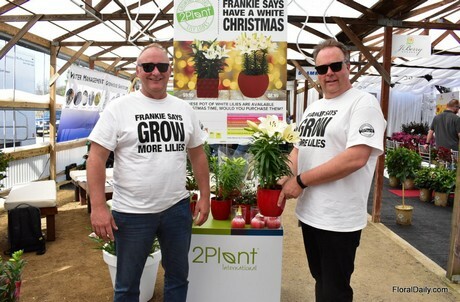 "Of course, we understand that these results will not persuade each grower to start producing only white lilies for Christmas, but it opens their eyes that there is a potential for other plants during the Christmas season as well. In 2008 Pieter van der Lans started 2Plant International with Frank Riteco. The company became one of the distributors of Lily Looks in North America and they started, together with Gardenworld, Bloom Pad North America, the future of planting flower bulbs in 2015. Later, they also added the varieties of Concept Plants to their assortment.